Launching a review of higher education recently, the Prime Minister spoke of her wish to make the UK a country ‘where your background does not define your future’. Naturally, education is almost always pitched as the key to upward social mobility – but to what extent does it really level the playing field? It is well known that people from wealthier backgrounds are more likely to be graduates, and that graduates earn more than non-graduates, That’s why the renewed focus on improving and simplifying non-graduate routes is a welcome commitment, and one which has been explored in previous Resolution Foundation research. But, focusing solely on the experience of graduates, how far does social background continue to affect the jobs that people do and how much they earn post-university? In this day and age, getting a degree far from guarantees you a graduate job with a graduate salary. In 2017, almost two in five graduates were doing non-graduate jobs. With the inclusion now of questions about parental occupation at age 14 in the Labour Force Survey (LFS) – thanks to lobbying from the Social Mobility Commission – we can find out the extent to which this is determined by social background. The results aren’t great. 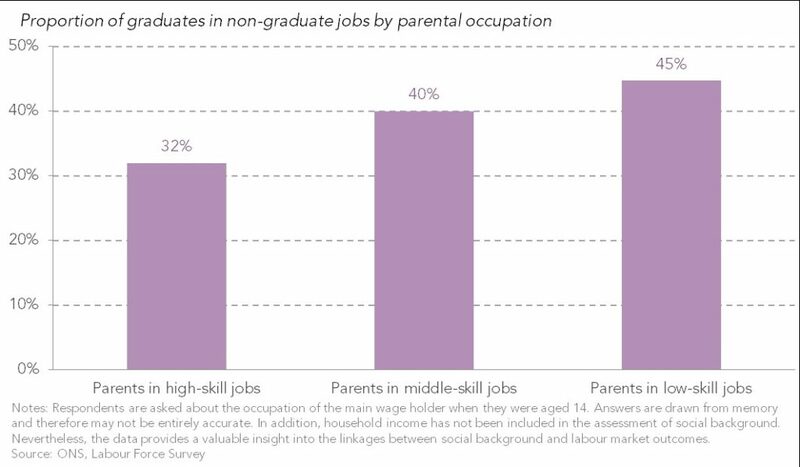 As shown by the chart below, people whose parents had low-skill jobs when they were 14 are around 40 per cent more likely to be doing a non-graduate job post-university than those whose parents were in high-skill jobs. These inequalities also appear to persist through time, as the next chart shows. 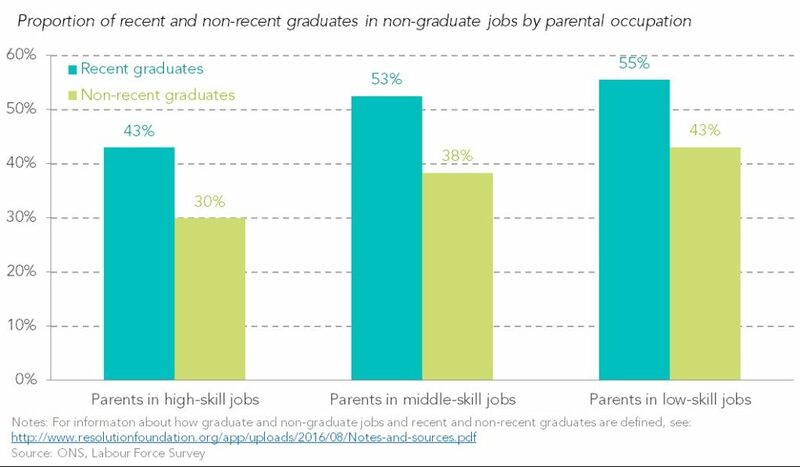 People whose parents had high-skill jobs when they were young were 13 percentage points less likely to remain in a non-graduate job five years after graduation and those whose parents had had low-skill jobs were 12 percentage points less likely to remain in a non-graduate job. So what does this mean for pay? We know that people whose parents had low and middle-skill jobs are paid less, on average, those whose parents were in high income jobs. What’s striking though, is that this pay gap persists when looking solely at people in graduate jobs or those in non-graduate jobs. In fact, this ‘social class pay gap’ is highest for graduates in non-graduate jobs, as the chart below shows. This likely reflects the kind of institutions people from different social backgrounds graduated from, as well as differences in the types of employment they’ve accessed. From these simple observations, it is clear that much of what happens post-university is still determined by certain socio-economic characteristics chosen for us by chance at birth – and that’s even before accounting for other things such as gender, race and disability. Previous analysis by the Resolution Foundation has shown that despite high levels of educational attainment amongst BAME groups, large disparities in employment outcomes and pay continue to exist. But this begs the question: why? First, the key to better understanding is better evidence and data. For example, the IFS have utilised anonymised tax records and student loan data to show that, even accounting for institution attended and subject studied, graduates from wealthier families earned more. With the addition of similar data in the LFS we could determine whether those from lower income backgrounds are more or less likely to remain in the fields that they studied. Of course interests may change, but this is still an important indicator of how far choice or circumstance play into labour market outcomes, particularly when assessing sectors with high barriers to entry. Furthermore, information about the schools that people attended pre-university would enable us to see how much of a difference independent and grammar schools make to those from low and middle income backgrounds, and therefore the extent to which class privilege transcends access to the best quality schools and education. 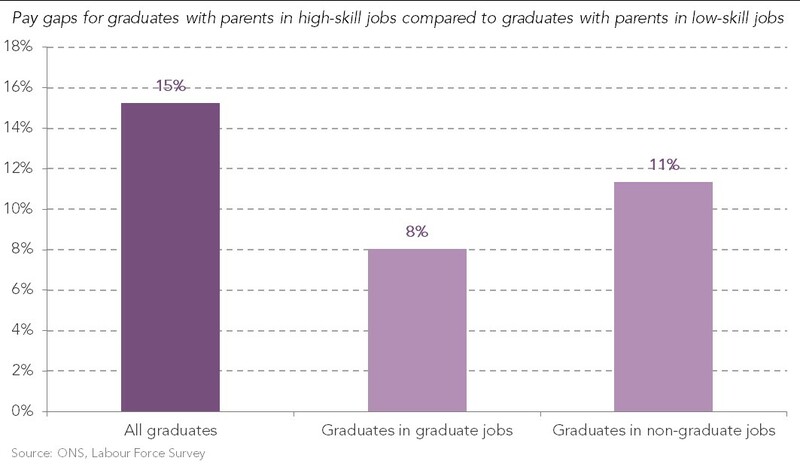 Nevertheless, it remains clear that parental background is a strong determinant of the jobs that people end up doing and how much they earn, even when looking solely at the experiences of graduates – both those with graduate jobs and those without. But education is not the only driver of social mobility. As the Intergenerational Commission has shown, inherited parental wealth is set to be an increasingly important determinant of young adult’s ability to build up assets of their own. It’s even possible that these are linked – having parental assets to fall back on might be one of the things that gives young people confidence to take risks in their careers – especially those pay-enhancing job moves that are all too lacking at present. That’s why the Intergenerational Commission is considering issues of skills, earnings progression and asset accumulation in the round, so as to avoid the today’s generational issues fuelling social mobility problems for decades to come.